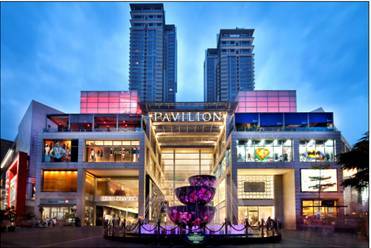 Pavilion KL reaffirmed its position as Malaysia’s Premier Mall and Top National Attraction with 22nd Award Win. 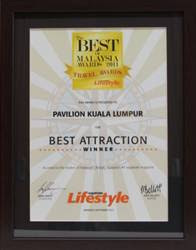 Pavilion KL was chosen as Expatriate Lifestyle Magazine’s ‘Best Attraction’ award in the ‘Best of Malaysia Awards 2011’. The rigorous process spanned 10 weeks, covered 16 categories and was 100% based on public voting. Michael Kors recently opened its first store in the region at Pavilion KL at one of the eye-catching street-front duplexes, and other international brands that are exclusively found at the award-winning mall includes Bottega Veneta, Diane von Furstenberg, Jim Thompson, and Yves Saint Laurent to name a few. The mall recently launched the first 360-degree Japanese themed precinct in Southeast Asia, Tokyo Street, celebrating Japanese arts, culture and food on Level 6, which has received an overwhelming response from shoppers. “We are ecstatic that within 3 years of operations, we have won 22 awards. We are proud but at the same time, humbled by our achievements as this only means that we have to work harder to continuously stay in the hearts of our loyal shoppers. We would like to thank everyone who has voted for Pavilion KL as the ‘Best Attraction’ mall. 2012 will be an even more exciting year for all visitors to Pavilion KL as we seek to make every activity, every event and every festive period even better than the previous years,” continued Ms Yap. “With the Federal Government’s positive move to abolish import duties of 300 tourism-related products as carried out by the Ministry of Tourism Malaysia, retailers have greatly benefited from the aggressive marketing campaign and Pavilion KL has become the duty-free shopping haven and must-visit lifestyle destination for all, “concluded Ms. Yap. Retail offerings at Pavilion KL continue to be a step ahead of the rest as the mall is at 100% occupancy, boasting 1.34 million square feet net lettable area and is home to 450 top international and Malaysian brands spanning six themed precincts over seven floors.